IHS Markit released a very important announcement about 5G deployment in the next future. According to the important analysis company, the new revolution is faster than what we could suppose and can count on much more interesting development elements. The global 5G transition is poised to take place at a faster pace than for any previous wireless generation transition, says business information provider IHS Markit. 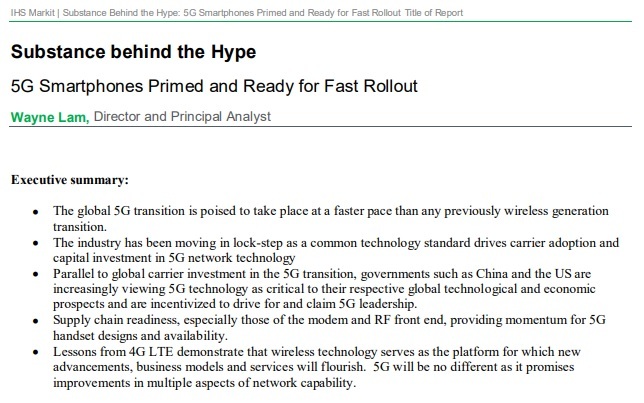 In its latest complimentary white paper, “Substance behind the Hype: 5G Smartphones Primed and Ready for Fast Rollout,” IHS says we should beware of confusing momentum with hype.